I have been entertaining people HERE for over 2.5 years now and don't plan to stop anytime soon. I have had some of the most amazing moments and memories in my life thus far shared with 100's on my stream laughing and face palming at scenarios I find myself in. There are people that have supported my Wife an I during this time unwaveringly and the amount of thanks you deserve is more than I could ever give you. If you decide to be a Patreon for Amy and Myself, you will be providing a monthly monetary pledge, (in which I will receive the full amount instead of 1/2), in return for as many laughs as I can provide. Also receiving peace of mind knowing you are a contributor in keeping one of the closest knit, helpful, hilarious communities currently residing on Twitch. I will be trying to send cookies to all my supporters. 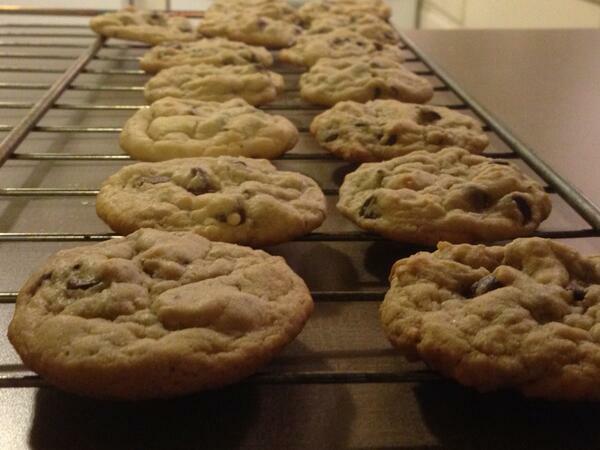 These cookies are homemade and the recipe is the New York Times #1 Rated Chocolate Chip Cookie recipe! I have been doing this giveaway on my stream for over 2.5 years now and have shipped all over the world. The longer / more you are supporting me for the sooner you will be chosen. We do this as often as we can, it may not be monthly as Aubree takes up a lot of our time and this giveaway requires a lot of that. We will do our best to stick to 2 monthly winners but this may end up being a bi monthly giveaway due to time constraints. If you are supporting me and the payment has gone through at least 1 month please contact me through Patreon so I can get you on the list of people in line for cookies. Thanks very much for all the love and support. My viewers are the best! Become part of the creative side and future direction of my stream. Help me fill monthly and weekly goal spots on the Wheel of Misfortune! If you have great ideas for games / things to fill the wheel / additional comments please message me on twitch or on here through Patreon! Become part of a video to be played at the end of every one of my streams thanking each person who is "currently" supporting me on Patreon for 10+ per month. The video will be made and completed as soon possible. If you choose to support my stream for 25$ monthly I will provide 1 on 1 advice and guidance with any streamer that requires help. I will do my best to set you up with correct settings in your streaming software, give you the tools to be able to organize and develop your info section. As long you continue a support of 25$ or more a month, I will meet you monthly at your leisure to continue to "coach" your in your streaming endeavor. If you decide to support my stream for 50$ or more monthly you will be invited for a google hangout session that will occur once per month. Being apart of this session will a very important part of my streams direction, games I am playing, fun things and ideas we could bring to the stream, so on and so forth. This will generally happen on the 1st Saturday night of every month unless of a special circumstance. I believe without goals it's hard really understand what you are trying to accomplish. I started out on twitch just enjoying streaming and becoming immersed in the streaming life, but now I find it necessary to set some goals for myself. This goal of 2,000$ monthly is my "end game". Not only will it completely take care of my monthly bills, but provides a little extra to put towards a massive student loan debt that is currently a huge burden on my Wife and I. Thank you for your help! I love my viewers.